In 2011 the collection of the South African Jewish Music Centre was donated to DOMUS by Mrs. Fay Singer, hence the Fay Singer South African Jewish Music Centre Collection. The aim of this centre is to preserve the heritage of Jewish music in its South African context. The Centre has been active in promoting the study and performance of Jewish music. 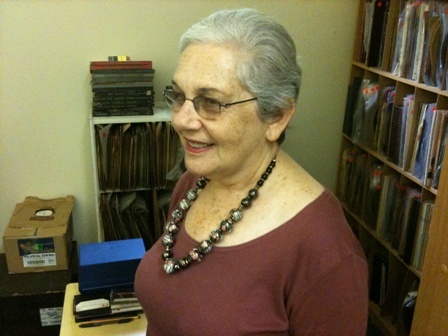 Under its banner, Fay Singer started collating material that grew to become the South African Jewish Music Archive. The material in this archive includes, amongst others things, gramophone recordings of South African and international Jewish music, and music and scores donated to the Centre by local synagogues, cantors and other individuals. Due to negotiations between former Stellenbosch University music student Annemie Stimie and Fay Singer, the archive of the South Afriican Jewish Music Centre was transferred to DOMUS. 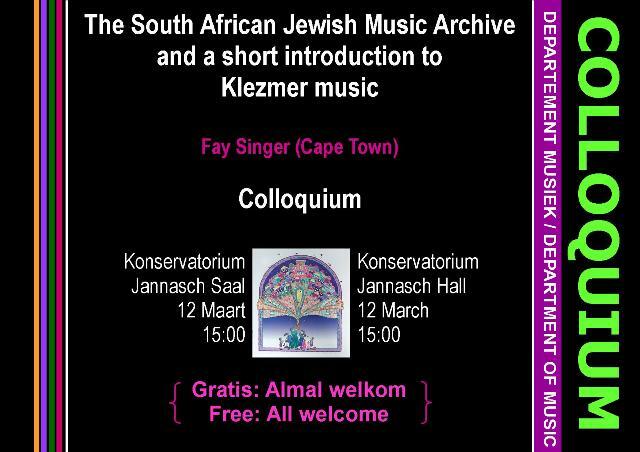 On 12 March 2012 Fay Singer was invited to present a colloquium on the South African Jewish Music Centre and Klezmer music. During this occasion Fay Singer gave an account of the origin and history of the South African Jewish Music Centre, followed by an introduction to Klezmer music. In the latter instance Matthew Reid from the group Playing with Fire, accompanied the presentation with clarinet performances of Klezmer music. First of all I need to say, that I would not be standing here today had it not been for Annemie Stimie. She learnt about the South African Jewish Music Centre after she had read my article about the Yiddish song Dort vo die Zeder in Jewish Affairs and contacted me. It took some correspondence until we met. I never looked back. I have also had the privilege to meet Santie de Jongh. It was at a time when I had felt at a loss about what would happen to the material of the South African Music Centre. During our interaction I was always intensely moved by the incredibly courteous and sensitive manner in which I have been approached. I must also express my deepest gratitude towards Prof Stephanus Muller for the kind and courteous manner in which he approached me with regard to the collection. I am reassured that the collection which has been so close to my heart has found a wonderful home under the loving and professional wings of DOMUS at the Music Department, Stellenbosch University. I am a Master graduate of the University of Cape Town, having studied the piano with Harold Rubens and later Laura Searle. I have played the piano from the age of 4 and this went right through my school years in Johannesburg, where I grew up. I was always called upon to play for all the different school functions and assemblies. Then I went to study music at UCT, College of Music. During my studies I acted as repétiteur for opera students, and I sang in the UCT choir. When I married my beloved husband and brought up our four children, I let go of my musical career for 25 years. When my children had all grown up I felt free to follow my musical vocation I auditioned at the College of music, for Lamar Crowson and Neil Solomon, graduating there with BMus Hons. I was invited to present lectures at UCT Summer School, and held an annual musical seminar over sessions of 5 days. These lectures and seminars were highly successful. Later I joined Barry Smith’s Choir and took over special rehearsals when needed and also played the piano for rehearsals. I was always interested in the music of my roots, our Jewish musical heritage. There is a close affinity between the Hebrew Bible and music and the liturgy and prayers during services. I decided to make Jewish music in Cape Town accessible again to ensure the continuity of our Jewish culture for future generations. Jewish people everywhere have distinctive musical profiles. In South Africa, the majority of Jews are descendants of immigrants of Eastern Europe (i.e. they are Ashkenazi Jews) whose music has been influenced by a specific religious and cultural history. This history is tied by heritage to the Yiddish language – for which I have a passion. The Ashkenazi musical tradition has a rich heritage of liturgical synagogue music. Its cantorial art follows ancient practices and so does the Reading of the Holy Scrolls (the cantillations of the Torah). In Orthodox practice, the ritual trop and nusach, the cadences and melodies of cantillation are still taught to every Jewish boy for his bar Mitzvah, while in Reform practice the girls also learn these melodies. In my research into Jewish music in Cape Town I have found a confluence of many other musical cultures. By establishing The South African Jewish Music Centre my aim was to promote the study and performance of Jewish music of all kinds: Synagogue music, Yiddish songs, Sephardi melodies (representing the Spanish tradition), Ashkenasic (the Eastern European tradition), Chassidic as well as contemporary Hebrew music. 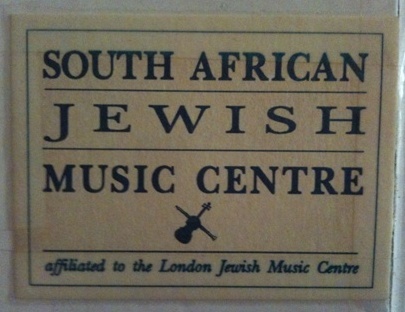 The South African Jewish Music Centre was inaugurated on 17 December 1992 in Cape Town. A year later it was affiliated to the Jewish Music Institute at the School of Oriental and African Studies (SOAS) University of London. Our Honorary Patron from the start was Mrs Geraldine Auerbach MBE, Director of the Jewish Music Institute, London. The S.A.J.M.C. whose work I saw as an on-going process had a lively momentum from the start. It soon became known within the Jewish community and I began receiving many requests to supply special music (recordings, tapes, CD’s or sheet music) for private functions, birthday celebrations, for broadcasting on Fine Music Radio, or for bar Mitzvah and weddings. February 1995 A performance by Ben-Zion Volpo, an Israeli cantor. November 1995: the Jewish Male Choir performed during a “Hainovitz Evening”. Cantor Hainovitz came from Israel. 1996: In collaboration with the Department of Adult Education, UCT, Extra Mural Studies, the SAJMC provided the background music for presentations. In 1996 the S.A.J.M.C. sent an emissary to Budapest to the famous Dohany Synagogue on a three day conference on Hungarian Jewish music. In the same year, on 26 August 1996, together with the Union of Orthodox Synagogues we organized an annual Choir festival to pay tribute to the two Cape Town cantors, the Badash brothers (Max and Philip). These Choir performances became an annual event which took place in different synagogues in Cape Town. It was my task to select and co-ordinate the musical programmes. The last one held was in 2009. The synagogues we performed in were the big Synagogue at the Albow Centre, Marais Road Shul, and Schoonder Street Shul in Vredehoek. 1996 was also the year in which the S.A.J.M.C. brought out the Young Jerusalem Quartet, which consisted of four young talented boys, in celebration of the festival Jerusalem 3000. During this year the S.A.J.M.C. received visitors and I recall the memorable meeting on 25.9.1996 by the great Hungarian musician Andor Izsák who was living and working in Hannover. In 1997 I gave a live performance entitled Music of the Old Testament at the UCT Summer School. During the same year I presented a lecture on Entartete Musik, that is Music which had been declared “degenerate” by the Nazis. My lecture was entitled The Cellist of Auschwitz Birkenau: Lost Music of the Holocaust. It was about Anita Lasker-Wallfisch who had survived. I was privileged to meet her in London and was able to bring her film Playing to Survive to Cape Town, where it was presented in the SABC studio, a deeply moving event. In the same year (1997) I organized an interdenominational chorus presentation entitled Hear the People Sing at the Baxter concert hall. It was the first time that the blowing of a Shofar, which only takes place during the High Holy Days, was demonstrated to a wider public. In 1997 Raymond Goldstein again visited Cape Town and this time we organized a function together with the S.A. College of Music. In 1998 I presented "Songs of Israel": Remembrance of Things Past under the auspices of the Jacob Gitlin Library. During this lively function, supported by three singers, we taught songs to the audience who sang along. In the same year I presented A Celebration of Jewish Music at the Department of Adult Education, Extra Mural Studies. 1998 was also the year in which the S.A.J.M.C. brought out the Leipzig Synagogal Choir to perform Hebrew and Yiddish folk songs. The choir consisted entirely of non-Jews and of course this for me was a delicate step towards interfaith initiatives among the Jewish community of Cape Town. In 1998 the S.A.J.M.C. staged a festival of all synagogue choirs in honour of the members of MACHAL, the South African soldiers who had participated in the 1948 War of Independence. In that year we hosted Raymond Goldstein once again. One of our highlights was an evening of Jewish Music at the Weizman School in Cape Town, also in 1998. On 21 December 2000 we organized the performance The Fiddler and the Cantor by Matthew Reid and the Israeli Cantor, Harel Amid, at the Tafelberg School. In July 1996 I started a Newsletter beautifully arranged and printed by my daughter Mara containing news. It dealt with books about music, research, sheet music. This first copy also contained a request for books, records, sheet music to be sent to the S.A.J.M.C. in order to preserve our cultural heritage. This request has received an amazing reaction on the part of the public. The next Newsletter, once more produced by my daughter Mara Singer, wrote about the visit of the famous musician and Director of Jewish Music Raymond Goldstein at the Claremont Shul and once again of Andor Izsák from Hannover. Unfortunately, we only had three editions and then the newsletter folded. From the year 1996 we began to receive large donations of long-playing records. They were stored in a private garage. The Jacob Gitlin Library took the Jewish Music Centre under its wing, but space, sorting and cataloguing of the vast material became a task too big to handle for the library and it could only act as an intermediary. In 1999 we had to vacate the garage which stored our material and was frantically looking for space. This was given to me somewhat clandestinely by a prominent member of the Reform congregation in Green Point, where the boxes were placed in a store-room under the floor. But then the synagogue had to be rebuilt and I had to move out with my boxes, find a transport – and where from here? Luckily, due to the intercession of the late Rabbi Dr Jack Steinhorn we found a fine storage place in the Highlands House Jewish Old Age home’s Choir loft of the synagogue which is never used. Volunteers, some of them residents, started to classify and catalogue manually the numerous records and books which were housed in cases and in specially made book cases which the SAJMC had made for this purpose. But here, unfortunately it remained, inaccessible to the public. Some of the items were in physical danger, because of the threat of insect infestation and no humidity control. There were plans for a temporary studio and Multimedia resource, the formation of a database of all items of sheet music and records, Live performances to increase public appreciation and knowledge of Jewish music and its cultural heritage as well as restoration, conservation, proper storage and secure display. Nothing of this materialized and I worried about this for the last several years. Meanwhile a new momentum developed in Cape Town in the area of Klezmer. The Yiddish word Klezmer is based on two Hebrew words: klei and zemer which means vessel and song. It refers to the professional Jewish folk musicians of Eastern European origin. Klezmer is primarily a modal music. The scales are known as gustn. It is similar to the synagogue mode ahavoh raboh. Klezmer instruments include violin and clarinet along with bass, cello, flute and brass, sometimes accompanied by vocalists. Klezmer music reaches back as far as 16th century Europe. It is the traditional instrumental wedding and celebratory music of the Yiddish-speaking Jews of Eastern Europe. It flourished in what we know today as Poland, Ukraine, Belarus, Lithuania, Latvia, Moldavia, Romania, Slovakia and Hungary. The melodies are relics from Eastern European Jewish life. These bands with their portable instruments went all over the countries to play for weddings and other festivals. On the way they picked up musical sounds wherever they went – so Klezmer is a mixture of many kinds of melodies – even Arabic. What is so special about this Jewish folk music is the sudden change of mood within a musical piece. From happy to sad, from funny to wistful – but basically Klezmer is celebration of life and the energy which Jewish people put into life. So their repertoire was eclectic, garnered from various parts of Eastern Europe to which they added a distinct ‘hot style’. This has led some music specialists to use the term ‘Jewish Jazz’. Through Klezmer, a culture and the memory of a people who have disappeared forever are revived. And here in Cape Town, this is where my friend and collaborator over the years, Matthew Reid who is here with me today, stepped in. Matthew Reid, who has studied music in England and in France, especially the Clarinet, was drawn to Klezmer in the 1980s, when he shared his lodgings with a music student who owned had a Giora Feidman record. Feidman is an Argentinian Jew who plays clarinet in a Klezmer style playing clarinet solos for the score to the film Schindler’s list, which won an Academy Award. Matthew loved this music and wrote down some of the tunes, trying to play them. He was captivated “by the way he gets such fascinating colours out of the clarinet – and all the different effects”. Years later, back in Cape Town, he was asked to play at a bar Mitzvah in a quartet and he rearranged some of the numbers into Klezmer, after which he and his band was invited repeatedly for Jewish festivals. I heard about him and I needed him for my presentations. I asked the band to play at a summer school lecture I was giving. Subsequently a Klezmer ensemble under Matthew’s direction was formed and I was privileged to guide and impart to the band the Jewish “twang” (in Yiddish we say: Kvetch) of this Eastern European folk music. Matthew’s repertoire grew and the string quartet became the Simcha Klezmer Band (Simcha means joyful celebration). Then the Jewish Board of Deputies invited the band to play at their AGM and thus Matthew Reid and his Simcha Klezmer Band became part of the Cape Town Jewish community structures. In 2006 the Simcha Klezmer Band changed its name to Playing with Fire. When the first of many Yiddish Song Festivals, organized by Philip Todres in honour of his late mother, was established in 2000, Matthew Reid and his Simcha Klezmer Band were already established. It became an annual event until 2009 and I was privileged to select the music for the singers who performed on the stage, according to the prevalent theme which ranged from nostalgic songs of the shtetls of eastern Europe to Cabaret pieces. Matthew Reid was the music Director. Jy kan nie anders as om ekstatiese byvoeglike naamwoorde te gryp nie: energiek, meesterlik, meesleurend, toeganklik. Hierdie is definitief een van die juwele van die KKNK. 2011 Was a watershed for the South African Jewish Music Centre. Due to the hard work and commitment the greater part of the collection housed in the Choir Loft at Highlands House was transferred here to DOMUS by Prof Stephanus Muller, Santie and Annemie, and Kerry Pierce, where I know it is in good hands and is attended to with outstanding professionalism and will be accessible, as I always wanted to be. Concerning the Music itself, it was crowned with the celebratory launch of the CD entitled Cape Town Shpiel: Playing with Fire, Klezmer in Africa, which took place at the Centre for the Book in Queen Victoria Street, Cape Town in December 2011. It was the sum total of the work of the S.A.J.M.C and Matthew Reid. With the performances of the Klezmer music I have found a home. I hereby want to present this CD to Prof Stephanus Muller as an expression of gratitude for all he has done for me and with that for the Cape Town Jewish Music Centre by giving us a home under the wings of DOMUS. 1. All these performances are noted down in more detail in the attendance registry book, which is presently in the collection at DOMUS. 2. Robyn Cohen. 2006. Yiddish Song Festival: Non-Jew who lets his hair down at Klezmer. Cape Times, Wednesday August 9. 3. Die Krit, 5 April 2006.